>We have a MARATHON RUNNER in the family! 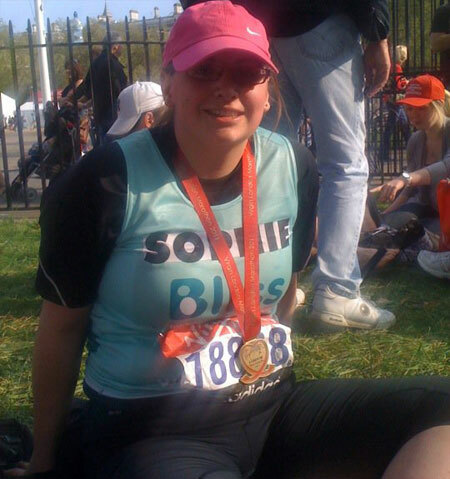 >My sister ran the London Marathon today! She completed it in 6 hours, 25 minutes (including toilet breaks she keeps telling everyone so probably 10 mins less than that) and we are all very very proud of her! Her time is pretty much bang on where she hoped it would be as she’d aimed for between 6 and 7 hours and you can’t get better than 6 hours 25 minutes for meeting that goal. She did it to fundraise for Bliss, the special care baby charity for premature and/or sick babies. Her sponsorship page is here. I’ve not seen her yet as access to public transport and the whole crowds and wheelchairs being a bad mix thing basically meant my going wasn’t a very practical idea (which I’ve been cursing all day). But having spoken to her and judging by the photo I’ve seen she’s tired but very happy! Very proud big sister here!